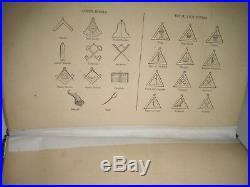 I usually have Freemasonry books , and PLEASE. To see my son’s old books. They BOTH do have their title pages. 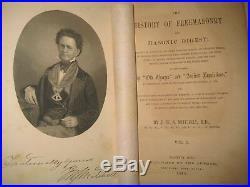 THE HISTORY OF FREEMASONRY; and Masonic Digest: embracing an account of the order from the building of Solomon’s Temple;its progress thence throughout the civilized world to 1858;the introduction of modern degrees called Masonic; and the first written history of Masonry in the United States. To which is added, the “old charges” and “ancient regulations” as collated by order of the Grand Lodge of England in 1722. 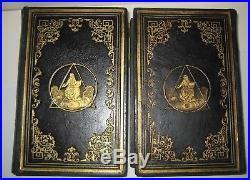 Also, the spurious laws, as published by Dermott; a code of Masonic jurisprudence, illustrated by the author’s answers to the questions of law and usage; a dictionary of Masonic terms; description of Masonic Jewels, regalia, etc. By the author, Marietta, Geo. 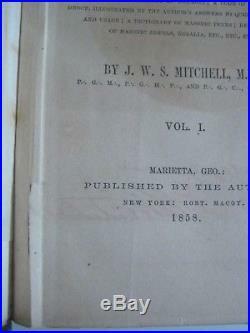 1858 – 1st edition! Size = apx 9.5″ by 6.25 “. IF YOU WANT IT GRAB IT – ONCE IN A LIFETIME OPPORTUNITY. Illustrated with 1 plate and just a few very tiny pictures at the end of some chapters. With 1,440 pages, I can’t imagine he missed anything. Only 4 out of the 10 index pages are shown! 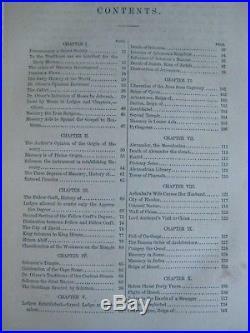 Some topics include: origin of Masonry, orders of Knighthood, Crusades, voyages, city of David, King Solomon’ Temple, lodges, destruction of Jerusalem, Alexander the great, wall of China, Egyptian mysteries, Rome, Judea, reign of Herod, before Christ 40 years, Reign of Henry VII, James I, George Washington, Druids, Jesuits, Ireland, France, Germany, Scotland, England, York, Scottish rite, influences of Masonry on a Pirate , even Pocahontas and Smith are mentioned. And so much more! Wish I could type faster!! 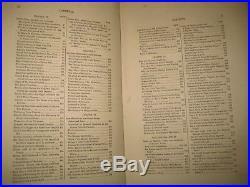 There are many subjects in here I have never seen before in a Masonry book. As they are part of the description. 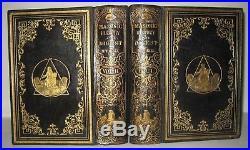 BOOKS ARE IN EXCELLENT CONDITION WITH BEAUTIFUL BRIGHT GILT PICTORIAL COVERS [fronts & backs] AND SPINE. 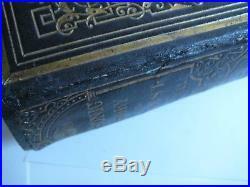 Gilt page edges all around. Truly a deluxe set! Covers and text blocks very secure. Some tips worn and touched up. Spine ends “topped off” with leather. Volume 1 front outer joint cracked, but holding very well – guaranteed- it was reinforced internally by the professional. The pages are all good and VERY clean with just a handful of small spots. Very small chipped edges. Endpapers are a little dirty. Title page in vol. 1 was bent /ripped near gutter and repaired with document tape on the back side. Separation between publisher’s info and dedication page. Some pencil writing on the ffep [name & date]. 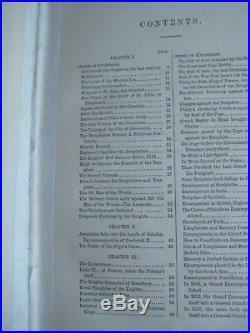 Gutters taped at back free endpapers of volume 1 and 2, along with the illustrated page, and contents page of vol. 2 [total of 5 gutters taped]. A MUST HAVE FOR ANY COLLECTOR. Please Add me to your Favorites list. AND check back now and then to see what’s new! Otherwise I can’t send you a new invoice. T can take up to 14 days to get back East. These will be well packed to arrive safe-thanks! 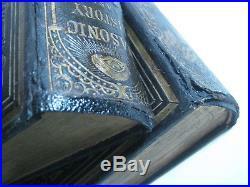 This book is very old and. May have accumulated bad smells along the way [musty basement/ mildew/ smoke]. I have found that. Dryer sheets in them for a few months makes a world of difference! My nose doesn’t work like it use to. So the old book smell doesn’t bother me. As far as I can tell -these books do not have a bad smell. 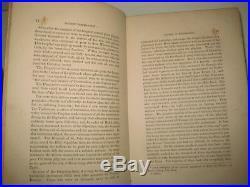 The item “RARE 1st EDT 1858 MASONIC ANTIQUE HISTORY of FREEMASONRY OCCULT KNIGHTS TEMPLAR” is in sale since Saturday, January 13, 2018. 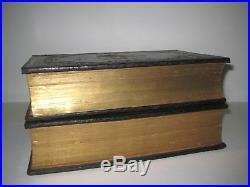 This item is in the category “Collectibles\Historical Memorabilia\Fraternal Organizations\Masonic, Freemasonry\Books & Publications”. The seller is “craminn” and is located in Sherwood, Oregon. This item can be shipped to United States.